Hmmmmmmmm. Kiln Park's facilities are more than acceptable but I suspect some of the clientèle are...how do I put this...common. I am such a bloody snob, I take after my father but did we really need Radio 2 at midnight along with the drinking and talking? Oh shut up Ren and get your head out your arse. People are people, just let them be people and put your ear plugs in. It's not like I'm a member of the landed gentry is it. She who must not be disturbed is partially deaf thus rendering her completely unaware of any shenanigans last night. She could sleep through the blitz I tell ya. When she finally awakens her ladyship decides it will be to her benefit to sit upon the rear of my motorcycle and let me do all the hard work. Again. So let me get this straight. Sharon is scared of my fiery stove so I make all of the brews and I do most of the cooking. Sharon's idea of washing up is a brief introduction to water so I do all the washing up. Sharon believes the use of deodorant means she doesn't need fresh clothes so I do most of the clothes washing too. And not only that I'm now the chauffeur. 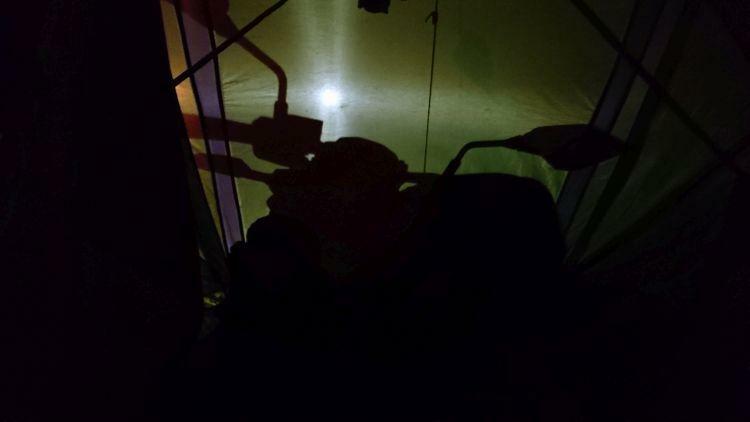 I have now taken on the official title of "Tent Slave". This pleases Sharon greatly. I have been "Tent Slave" for far longer than I realised. At least the sun is shining. This being mid September it isn't hot, it is a good riding temperature. The wind has abated to a gentle though occasionally stiff breeze making riding a delight. We are exploring the lands behind Tenby today, let's see what's what. 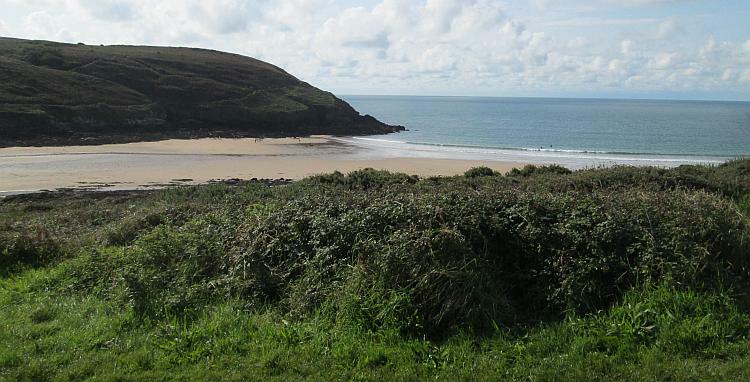 Manorbier brings forth another broad sandy beach nestled between 2 outcrops of rocky South Wales coastline. There's a castle snuggled into the hillside and just a few too many camper vans and mobile homes around here. We only stop briefly for a few snapshots. Just another of the countless delightful coves with beaches. 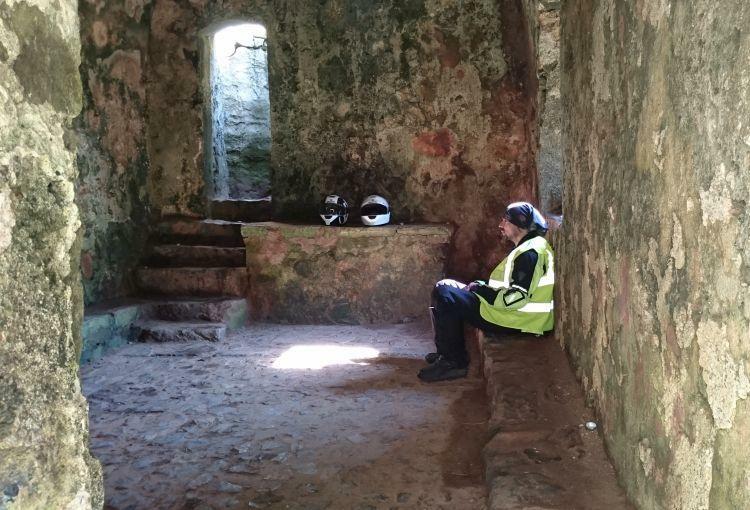 It takes a while for me to find our next stop - St Govan's Chapel. I was concerned that it may be "an attraction" with paid for parking, crowds and tat shops. We merely find an almost empty parking area and a bored looking chap in a hut away from the car park behind a short wire fence. We've passed warning signs of military activity so I can only guess his role is to stop random tourists from wandering into a shooting range? This suggest a polite but firm "No Entry"
Beware the stone steps down to the chapel. They are steep, well worn and precarious even with the contemporary handrail. I pity the souls that built and worshipped at this chapel hundreds of years ago, it must have been a clear demonstration of faith. The chapel itself is tiny, no larger than most folk's bedroom and considerably less well appointed. Stone seats to either side and a stone alter, unshuttered windows and doors and that's your lot. It is cool and damp on this fair weather day, in a winter's storm it must be hellish. I find it fascinating too. How was it built? Why was it built? Sharon believes this is warmer and better decorated than my own bedroom. Probably true. I sit a while as Sharon pokes around. I can imagine 7 or 8 shivering monks sitting on the hard cold stones making their piles ever worse. A head monk is chanting a religious text and tinkering with relics upon the stone alter. Outside a tempest is whipping the sea into such a frenzy spray spews forth through the openings. They all shiver, wiping the sea and the snot from their faces. My life is quite comfortable overall. We pass through the town of Pembroke which appears to be nice enough, Pembroke Dock is more industrial and down to earth you might say. I stumble upon a cafe so we stop for a brew, there's too much blood in my teastream by now. As we sip hot trucker's tea a stream of cars, trucks and vans start to pass where once there were barely none. Ahh, "Dock" presumably includes a ferry and the ferry must have just arrived. I always knew about the Fishguard ferry to Rosslare in Ireland, I did not know there was one from Pembroke Dock to Rosslare too. I do now. Handy that, Rosslare is the best way to get to the best bits of Ireland, it misses out that silly Dublin City nonsense. We hop across the countryside once more and into Saundersfoot. I don't know how I feel about Saundersfoot. It's a lovely little coastal resort town complete with harbour, beach, traffic and car parks. I just can't help but feel a sense of deja-vu. Oh dear, poor poor Ren, he keeps on having to go to nice places, please someone send him somewhere horrible. Sharon treats us both to freshly made piping hot doughnuts which we greedily devour while we sit on a bench looking out to sea. Life can be hard at times, challenging, upsetting, distressing and even depressing. This isn't one of those times. This is comfortable, easy on the eye, relaxing and pleasurable. I could eat a thousand doughnuts but I'd better not. It's a shame we have to endure all these pleasant places and doughnuts. Back at the campsite and we have a little time on our hands. 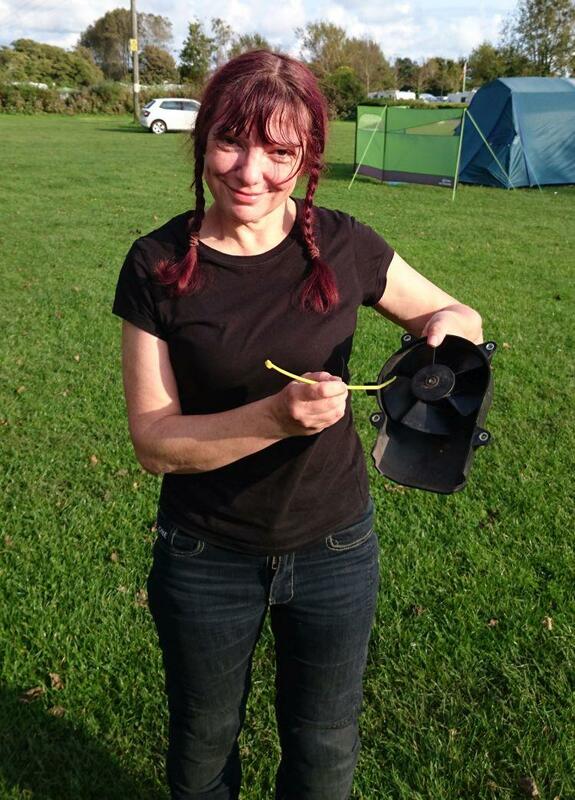 Sharon suggests we look at her fan which had been noisy. Between my toolkit, Sharon's little fingers, my mechanical skills and Sharon's bloody minded determination we somehow make things all better. We got the fan out but will we ever get it back in? This evening after we've dined in the tent we venture off to the "facilities" at Kiln Park. We're out of season and this is a Tuesday evening so it's not busy. However the arcade slot machines whistle beep whirr then play short tinny tunes in endless cycles and within one hall some form of godawful family entertainment is in progress. 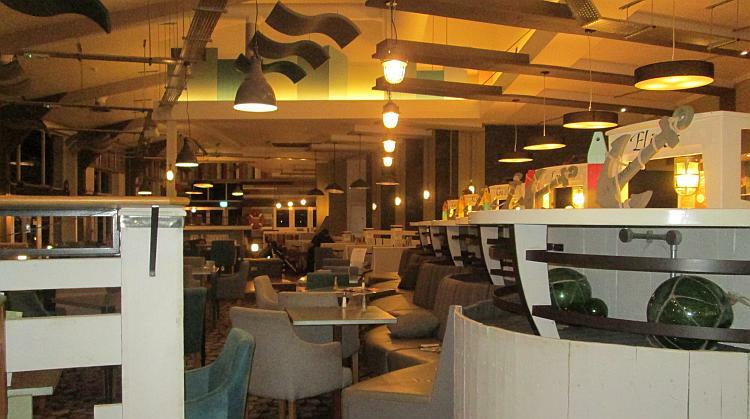 We seek haven (sic) in the restaurant come bar which is much better save for a screaming baby with a frazzled mother. We've only come for the WiFi internet access to be honest but I bravely open my wallet and buy us both a glass of coke to at least make it look like we're possibly out for the evening. WiFi and pop. It could be worse. Tomorrow and Thursday's weather forecast is atrocious. I must admit I have a notion of maybe seeking one night's shelter in a hostel or a cheap hotel. Sharon causally points me in the direction of this website, a campsite on the Gower Peninsula that just so happens to have some "pods". Heated "pods". Heated, warm, dry, rainproof, windproof "pods". She keeps on casually suggesting. She flutters her eyes. She makes me double check the forecast. She thinks it might be wise. She mentions other alternatives. She points out the advantages. Dammit. Looks like we're spending Wednesday and Thursday night in a "pod". In the morning I go and do it again. Yes I decide to pillion. Is this it then, the end of my riding? Have I given up? No, I have grown up. I am of a age now where on reflection I can makes choices and live with them. I no longer have the new rider angst of having to prove myself, to both myself and anyone else. I have thoroughly enjoyed the pillion days I have had this holiday so why not have more of a good thing? If we are exploring it simply is a fact that it is easier on one bike. Ren does not need to keep an eye behind him all the time or wait for me while I painstakingly paddle the bike back and forth to turn around in a sloping dead end. Being pillion I enjoy looking around while affording the opportunity for some nice hugs and chats with Ren. Once safely installed behind Ren on his bike I give him my first big hug and sit back and smile. The sun is out, lets just enjoy the day. 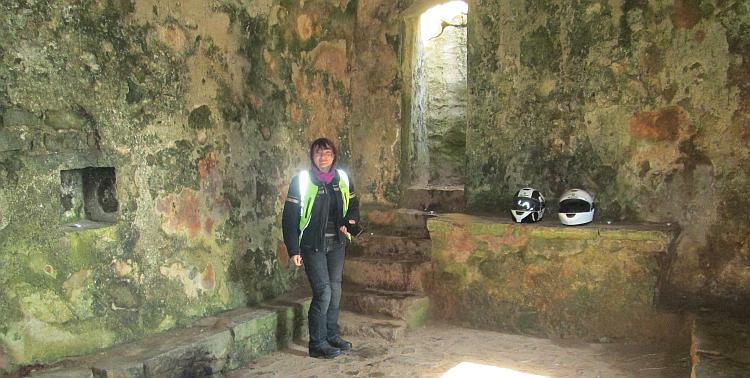 We stop at St Govan's Chapel. a famed tiny hermit home built into the bottom of the cliffs. There are various legends as to when and why this chapel was built but whatever the rhyme and reason it makes an interesting place to visit. 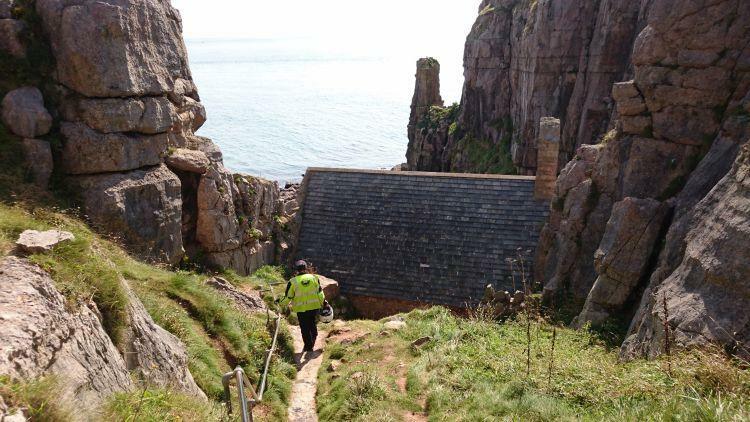 The decent is via small slippery steep steps, so if you follow in our footsteps, tread carefully. Make good use of the handrail on these steep steps. The chapel is indeed tiny and not particularly impressive. It is the desolate and precarious location that makes this chapel rather awe inspiring. The cliffs could tumble upon your head at any time. Though calm today the sea no doubt boils and rages inches away on a stormy night. I am not one for crowds but even for me this strikes me as a very extreme place to want to live. That said as I step outside the chapel to the rock strewn beach on this sunny day this place does exert a particular sense of tranquillity. 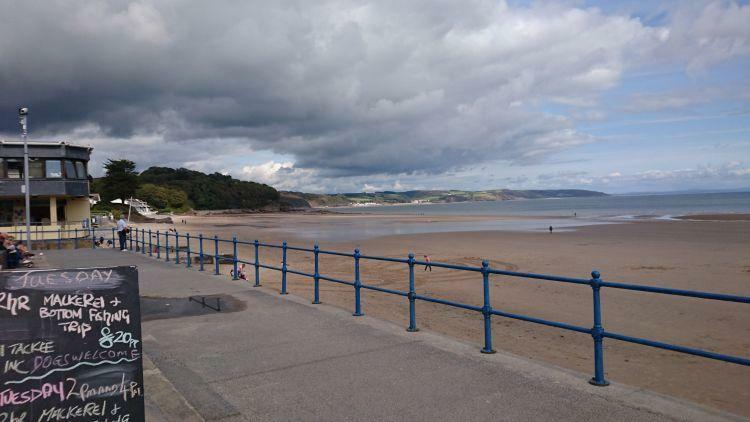 We explore more of the area on the bike and end up for lunch at Saundersfoot. 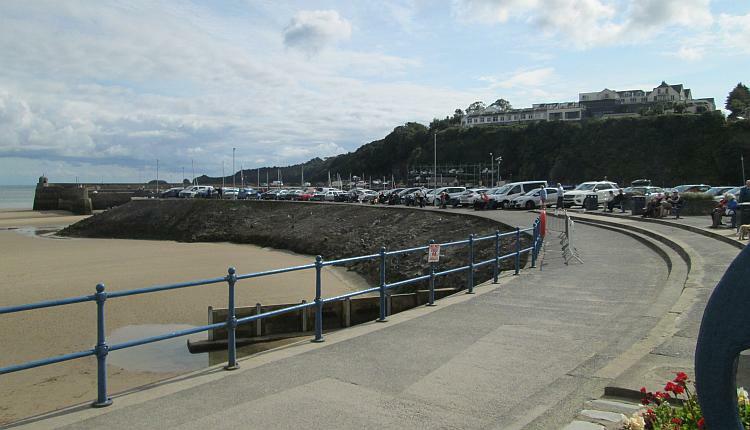 Saundersfoot was once a busy port dealing with coal. Today it is the holiday maker such as ourselves that keep the little harbour bustling along. Ren and I sit on a bench overlooking the pleasant beach while dining on hot sugary doughnuts. 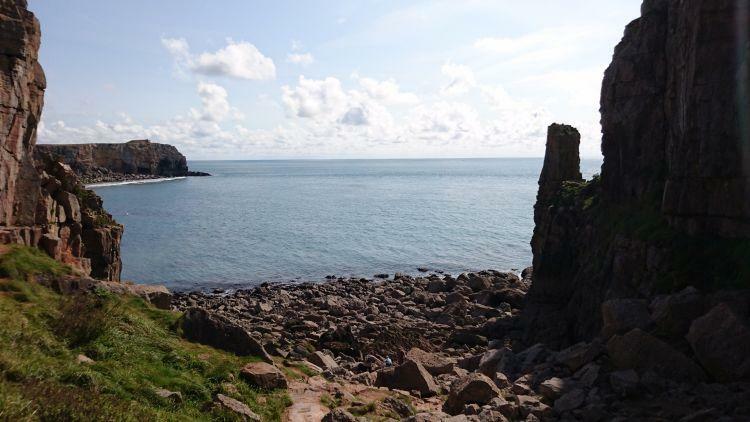 I just have to say it again because it is true, Pembrokeshire has many numerous and wonderful beaches and coastal villages. I am truly delighted by all we have seen so far. Once back at the tent the sun is still shining. Is is even warm enough for me to strip down to my t-shirt and jeans. Whooh positively tropical then. Now as we all know I am a lizard and therefore solar powered. 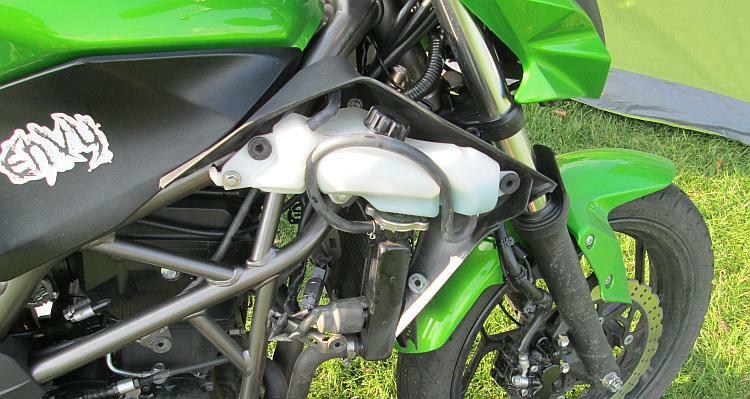 So as the sun warms my skin I have a burst of energy that is best utilised by looking at the dodgy sounding fan on my Kawasaki. With Ren's guidance I remove the fan from the bike. Trying to turn it by hand reveals it is not smooth at all. I compare it to how Ren's fan feels on his Honda and it is obvious my fan has a problem. As I turn it I can feel it catching and grating. There must be something stuck in there. 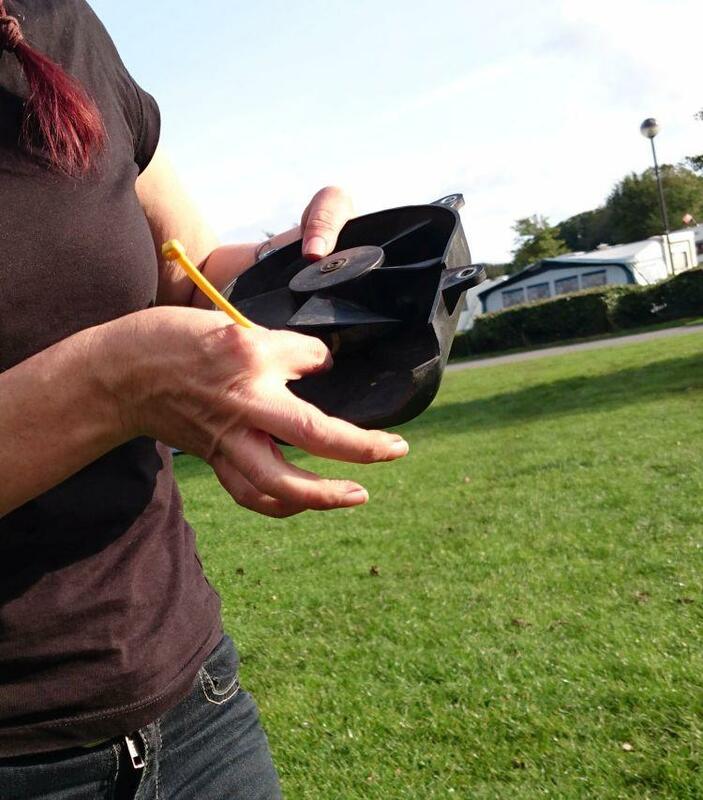 Unfortunately we do not have the tools to take the fan completely apart to investigate further. Hmmm what to do? I conclude that if something got stuck inside, probably grit, then I may have a chance to get it out again, but how with no tools? I need something thin and flexible to push in between the fan and its outer covering. Dah-dah! Light bulb moment. Cable tie. Yes it fits in nicely. Jiggling the cable tie around while turning the fan slowly by hand begins to loosen the trapped grit inside. After a lot of patience I am finally rewarded with a smooth turning fan. Wahoo success is mine all thanks to the humble cable tie. Never leave home without one. Well at least do not go on holiday without one. I can be very determined when I think I can do something. My trouble is I do not lack the determination to keep on at something it is knowing when to stop and admit defeat. I once spent over 12 hours with my whole arm down a drain in my garden, convinced I could unblock it if only I kept trying. The bruises never made me give up, only darkness did when I could no longer see anything. As it turned out I was wrong in believing I could do it, the blockage was eventually found in the street. However this time my persistence paid off with the fan and I am most pleased with myself. What is less pleasing is the weather report. It may be all sunshine now but apparently this is the calm before the storm as all manner of deluges of Biblical proportions are forecast. We retire to the bar to discuss our options. I somehow manage to convince Ren that sitting in a tent in a howling gale and never ending rain may not be fun. But we do not want to go home so what to do? A good search on Google comes up with some availability for fairly reasonably priced camping pods in the locality of our next chosen destination. To my utter joy and amazement Ren books us into this luxurious accommodation for not one but two nights. Ok someone pinch me because I have just entered a alternate universe. and never know the luxury a pod had to offer. Oh goodbye cruel world. The aliens have landed, is it me they want or my bike now it has a working fan? Not Even Wales! With a storm set to cause havoc across the UK is this day the best day to set out on a camping holiday? Maybe not. Into Tywyn Finally Sharon and Ren get themselves out of the house and onto the road. They've set out, but have they got everything? Exploring Around Tywyn Mid Wales provides an engaging, gorgeous and sometimes challenging landscape to explore. With all the sea, hills, mountains, valleys and single track lanes that go nowhere, our explorers are exploring. Bracing Winds And Wobbly Hobbits Between the rain and the beauty Sharon's riding is creating mixed emotions for her and Ren is getting giddy over a TV programme. Exploring St Davids - On Foot It is time to leave the bikes for just one day and set out on foot to explore the tiny city of St Davids. The city is small and pleasant, the cathedral is just sheer delight. Exploring Around St Davids In the land of a thousand coves Sharon and Ren are looking into a handful of them. There's a chance Ren's 500 might not be getting out of one of them though. 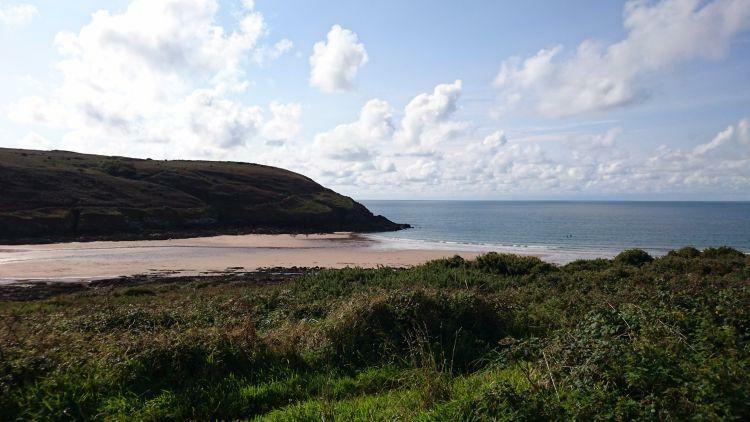 Is Tenby Really Utopia? Tenby has been much lauded to both Sharon and Ren but now it's time to see if the reality will live up to the hype. Will Tenby be amazing or an amazing flop? Exploring Around Tenby Between the endless cute coves, splendid coastal resorts and curiosities there's time for some field repairs. The big worry now is the forthcoming weather. Spoiled Rotten In Gower Sharon is for once actually preying for rain and Ren is wondering if Sharon is going to kill him. What on earth is going on? Exploring The Gower Peninsula Considering the day was supposed to be a washout Sharon and Ren get to look around the Gower Peninsula in good conditions. There's only one problem with Sharon's perfect beach - the walk back. New Friends And Llandovery While the weather is very much against them Sharon and Ren enjoy the day with new friends and a lot of hot tea. They're heading a little North in South Wales. Exploring The Brecon Beacons After yesterday's deluge will the soggy campers get chance to dry out and actually see The Brecon Beacons? Sharon is bleating out some awful sheep puns too. Epilogue - South Wales 2017 Once again another trip comes to an end and it is time to return to the reality of everyday life. Neither Sharon or Ren are ready for it to be over. 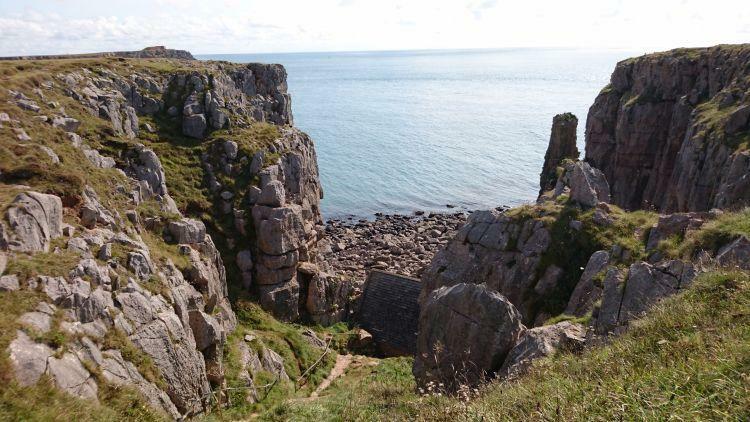 Well done both on your recent South Wales/Pembrokeshire trip!. I just wanted to comment, if i may, on Ren's views/experience of the 'clientele' at Kiln Park Camp Site. No need to aplogise Ren. Indeed, Your both very brave going to that type of establishment in the first place!. A lot i could add, but suffice to say, your term 'Common' is an understatement. Sadly, a reflection of 'society' in general...at least here in the U.K!. I would use the term 'Townies' (and more unprintable besides!!). The majority just have to be making a noise of some kind, no matter what the time or hour, and leaving litter etc. Having worked at a similar establishment on the Llyn Peninsular in North Wales, in which i was cleaning caravans, i have 'seen it all' in terms of 'behavior' (i use the term in the loosest sense!! ), not to mention the mess/litter left behind. thank you for 'telling it like it is' so to speak, in a culture where the 'system' aims to foster a 'Self Censorship' mentality...I.E ''Should i express this or that view'', Err Probably Not''....So, please keep the interesting travel articles coming, and exactly as you see it, or feel. I have recently found your site, Very good, and a nice change from the rest. 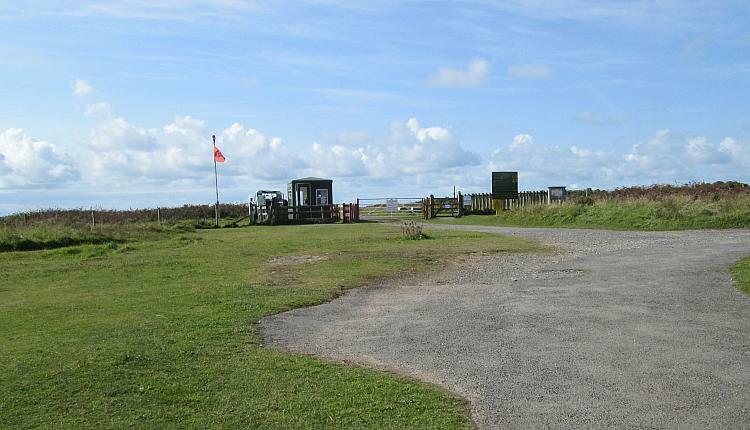 I moved to Pembrokeshire earlier this year,having lived previously in the neighbouring county of Carmarthenshire, and love it here, Avoiding the usual 'Tourist Traps' is not a problem, with a maze of 'B' and 'Unclassified' roads/lanes here!. I have my trusty CBF125 (25,000 Miles to date), and my Piaggio X8 250 Maxi Scoot, both are ideal for those roads, A slower pace of life, with nice views/scenery, away from the 'Mad World'. If however an readers wishing to visit the coast/larger towns/tourist attractions here,(and you seek a 'quieter experience', then i recommend doing that from late September to the week before Easter....before the tourist 'hordes' descend!! Sincere best wishes to you both, Thanks again. Thank you Chris Rees. I often wonder if these missives ever get read so it is heart warming to know that they do. Firstly fiscal. While I'm not as poor as a church mouse I'm not sure I could afford even a modest property in "ye countryside". I have tried selling my body to fund this but frankly I was making a loss. Secondly familiarity. If you are surrounded by delightful scenery and fabulous roads to ride then, then, then where do you go to go and ride some good roads and soak in wonderful scenery? 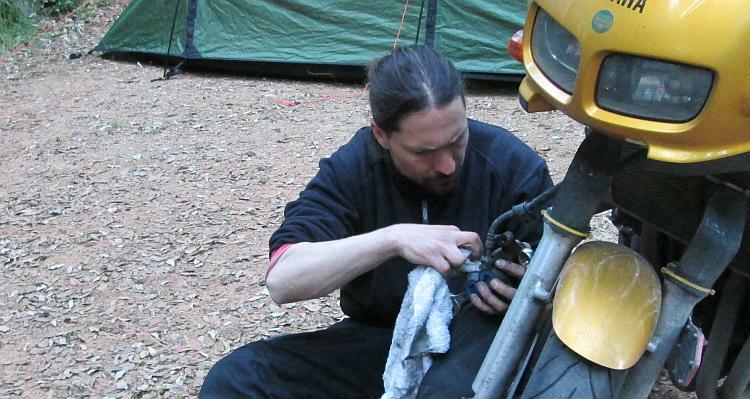 I turn a tap and clean safe drinking water comes out - so much so in fact I have enough spare to wash my motorcycle. I take it for granted, it has always been this way and it always will be. Yet to an African child this would be a miracle and indeed a terrible crime. As she walks with buckets to water a small crop I wash my wheel. How do you appreciate your surroundings if you're always in them - that's my point. Well....To start, I am retired....Yipee!! Though, on a very modest private pension. I live in private rented accommodation within the grounds of a non working farm, This is between Tenby and Pembroke, its a small Hamlet, lovely and quiet. it took some finding, but then the best is worth waiting for!! My point is affordable places like these do come up, it takes belief and determination, but then so do lots of things. Rent here is £350.00 per month! Based on 'average' U.K rentals, this is a bargain then! I appreciate my surroundings...always, and so grateful to be here, away from the 'rat race' (to be diplomatic!!). I can ride the roads here constantly, and with so many choices of routes, never getting bored of it.And Yes, I can go other places if i wish, such as Mid or North Wales, or S.E Wales and the borderlands, which i do on occasions, but i appreciate what i have here too. What is lacking in so many individuals lives is appreciation of what they have, and stems from, and perpetrated by the mainstream media/advertising who's role/reason for being is to convince the majority that they never have enough,are unhappy and must always chase more of everything! May work on the said majority....But not on me! I binned my T.V years ago, and do my own thing, I do not 'follow' anyone, or look up to anyone, I like the 'simple life' which of course is my choice. Everyone on this planet is a unique individual, who has free will, and free choice, and each and everyone's 'Situation', no matter how wonderful...or horrid (it appears to us) is ultimately that persons 'life path/journey'. That is the 'world' they (and we all in our own lives) create via our thoughts/actions, which manifest as our everyday 'reality' And we can choose to stay in that 'reality' or change it....Not always easy, as the 'ego' or 'inner voice' tries to put obstacles in our path, i.e ''I want to do this or that...But ooh that's a big risk/worry..Best not do it then'' etc etc....Often after taking that 'big step' or 'risk', it turns out to be a positive move, and one we regret not taking sooner!!. The fact is we can only change ourselves...We cannot change the world,or anyone else as individuals...no matter how we may try or want to! As Gandhi is famously quoted ''Be the change you want to see in the world'' e.g By being the best we can (not in a material/superior sense), but by having compassion/having gratitude and love for both ourselves and others, we then send that energy/vibe out into the 'collective' or universal 'consciousness' of the planet, which over time, and with enough participation can bring about that change....However the 'Mainstream Media' and 'News' (especially) is all about 'Fear' 'Doom and Gloom' and War/Negativity/Debt...To keep the 'masses' in a 'Low Energy/Frequency' (or an unconscious state) of fear , Give the 'News'/Papers' a miss for a week or more....See how much better you feel!! In closing....I have a home, great health/energy, no debts, little or no stress, food on my table...Oh and my biking! That is 'wealth/prosperity and abundance' for me..I am very happy with what i have....Nuff said. Anyway.....Hope i have not 'rambled' on to much!! Food for thought...And my views on things as i see them. Whether you want to (for example) relocate...or stay where you are.....Its just a choice....only you can make that choice....Enjoy. I am slowly (very slowly) learning to be happy with the things I have and appreciate how lucky I am in so many ways. I do still hanker after certain things (a garage is my current target) but this hankering is much less angst ridden and desperate than my younger angsts. I can look around from my desk and I have a house, a bed and food so I am already way ahead of the game. I have 2 motorcycles but of course I want more. I have a job. I have friends. I guess everything else is just icing on the cake. Hmmmm...cake, I want cake. Yes....Your way ahead of the game for sure!! Well done, Your on the right path..Enjoy. I have to agree Chris. I gave up buying newspapers years ago and indeed think the Victorians found the only legitimate use for them a hundred and fifty years ago when they used to cut them into little squares and hang them in the privy. I also gave up watching/listening to the news on TV/radio about five or so years ago. I occasionally feel guilty about this 'head in the sand' attitude, but news coverage only succeeds in raising my blood pressure or making me fed up, and it's my life and I choose to abstain, so there. I'm a complete atheist, but as an epitaph something along the lines of 'He never did anybody any deliberate harm, and lent a helping hand where he could.' would do nicely. Anyway, this is all a bit deep, and naff all to do with motorbikes, so I'll shut up! I do wish to keep some notions of what is going on in the world around me, it is a question of striking a healthy balance. Simple things like knowing there's a lot of scams out there can help me to avoid them but I don't wish to live in abject fear that everyone I meet is out to fleece me. I keep an eye on the news but take it with a pinch of salt. There's nothing wrong with a little polite philosophy from time to time Crazy Frog. Just don't let it spoil the pleasure of motorcycling.